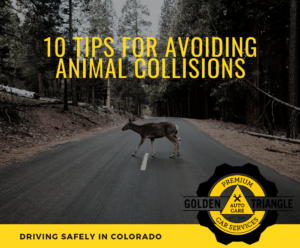 In late 2018, we read a report shared by AAA Colorado: Coloradans reported 6,858 wildlife collisions in 2016, a 45 percent increase over 2013, according to AAA Colorado analysis of Colorado Department of Transportation data sets. Nationwide, animal-vehicle collisions result in 150 human deaths, tens of thousands of injuries, and more than $1 billion in vehicle damages each year. In Colorado, per AAA Insurance data, the average resulting repair bill runs upward of $5,000. There is speculation that the increase in animal/auto collision incidents correlate to the increase in Colorado’s population. “As urbanization continues to spread into what were once rural environments, people and their vehicles inevitably come into conflict with animals more and more often,” commented Skyler McKinley, AAA Colorado spokesman. November is the single most dangerous month when it comes to animal collisions, and deer are involved in more collisions than any other animal. Consider that we go off daylight saving time the first week of November, which puts commuters on the road after sundown. That’s also the same time larger animals, such as deer, elk and bears, are the most active. 1. Keep your eyes moving back and forth. Continuously sweep your eyes across the road for signs of animals. While most crashes are caused by an animal darting in front of you, one might also run into the side of your car. 2. Be especially attentive in early morning and evening. Many animals, especially deer, are the most active during prime commuting hours — roughly 5 a.m. to 8 a.m. and 5 p.m. to 8 p.m. This is especially true for our commuters driving from Colorado foothill communities into the city or suburbs to and from work. 5. Honk your horn with one long blast if you spot an animal. A long blast on your horn may frighten large animals, such as deer, away from your vehicle. The Insurance Information Institute advises against relying on devices such as deer whistles and reflectors, which have not been proven to reduce collisions with animals. 6. Use brakes if impact is imminent: try and slow down your vehicle to reduce the force of impact. 7. If an animal is in your path, stay in your lane. Swerving away from animals can confuse them so they don’t know which way to run. It can also put you in the path of oncoming vehicles or cause you to crash into objects on the side of the road. 8. Always wear a seat-belt. Per the Insurance Information Institute, the chances of getting injured when hitting an animal are much higher if you don’t have your seat-belt on. 9. Don’t go near a wounded animal. A frightened and wounded animal can be unpredictable. If it’s in the middle of the road and blocking traffic, call the police or sheriff immediately and request assistance. 10. Consider purchasing comprehensive coverage, if you don’t already have it as part of your insurance policy. Comprehensive insurance covers animal collisions, among other things. Be sure to share these tips with new drivers in your household – they don’t have as many years of driving experience under their belts yet. These are good reminders for all of us. Thanks to AAA Colorado for inspiring this post.